If the episode has a flaw, it’s arguably the opening flashback to Jimmy’s days in Cicero. Not that the flashback isn’t entertaining in itself. Jimmy’s drunk-in-an-alleyway sting is so complex that you don’t see the reveal coming. 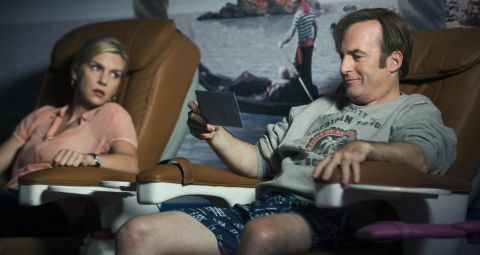 And it’s a delight to find out that the name Saul Goodman isn’t something he coined specifically for practising law, but is a play on words he’s been using for years. Also featured in this episode: “Battle Hymn Of The Republic” by Herbie Mann (when Jimmy is hanging out in the nail bar) and “Unsquare Dance” by The Dave Brubeck Quartet (when he rings around uninterested journalists). Truth be told, Jimmy’s continuing war with Howard Hamlin isn’t all that engaging either. We signed up for this show to see Jimmy getting sucked into the criminal underworld, not dabbling in trademark infringement. Tossing in Tuco early on was a strong hook, but now the show is demanding a little patience from the viewer as it engages in rather more low key plotlines and quiet character building. It’s earned that patience… but it might get a little frustrating if the series don’t step up a gear within the next two or three episodes. When Jimmy goes to the tailors you sort of expect the Breaking Bad-universe version of those scenes where a newly regenerated Doctor picks out their costume, so it’s a little disappointing to see him ordering a tasteful pinstripe instead of some flashy Saul Goodman duds. But the shot of him examining a bright orange shirt is a neat little hat tip to his future style choices. Award yourself a hundred geek points if you recognised Jimmy’s tailor as one of the Knights Of The Round Table. Actor Paul Geoffrey played Percival in John Boorman’s Excalibur. Jimmy pretends to save a billboard worker from falling to his death to generate some publicity.